One of the aviator's greatest challenges--and fears--is flying in foul weather from an aircraft carrier. With only instruments to guide them, pilots are under constant pressure to keep their aircraft under control. 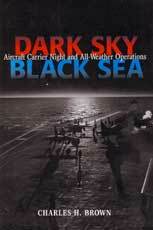 This book addresses the ability of carrier combat units to fly and fight at night and in any and all weather conditions. From the early experiments on the USS Langley in the 1920s, book traces the changes in the aviator's training, operational techniques, and tactics as technological improvements were made. It shows how the addition of the angled deck and mirror to the carrier had great impact on night flying. It chronicles developments before and during World War II and the Korean, Vietnam, and Cold Wars and closes with a vivid description of naval air combat during the Persian Gulf War, a time when night flying operations had become common. 252 pgs, hardbound w/dust jacket, 9.25 x 6.25, photos.